The 2018/19 Winter Programme proved to be a great success as members enjoyed an array of speakers and activities. 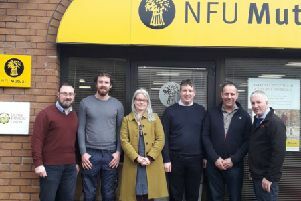 In October the Group welcomed Dr John Gilliland OBE, Director of Agriculture, Devenish Nutrition to the Wildfowler as our first guest speaker of the year. Members learned about John’s experiences and ‘The Land of Dowth’. This proved to be a very informative evening which members thoroughly enjoyed. In November the group hosted a Farm Family Health Day. This was a great opportunity for members to get involved and learn some basic first aid training skills. The farm medical van was in attendance for anyone who wished to have a health check carried out. The day proved to be a great success with many members and their families in attendance. Over 50 members joined together in December at Harrisons of Greyabbey for our annual ‘Charity Christmas Breakfast’. This proved to be a very enjoyable morning and gave members the opportunity to enjoy the social occasion and also raise money for the Air Ambulance. As it was the 100th anniversary of the Ulster Farmers’ Union it was a good opportunity for past presidents from the group to share their experiences serving as president. Billy Martin, John Rankin and Will Taylor all shared stories and the difficulties that they faced during their time in office. The silage competition again was well supported and the winners of the Group competition were as follows: Alternative forage was won by W+R Corrie; dairy section was J A Angus & Partners; beef and sheep was B+J Martin of Gordonall Farm; the baled silage was won by P+D Kelly of Ballycam Farms and the new entrant section was won by R+S Rea. Congratulations to B+J Martin, of Gordonall Farms, who were placed first overall in the national beef and sheep silage section, and to J A Angus & Partners, who were placed third in the dairy section of the silage competition. If anyone has any queries please do not hesitate to contact the group office on 02891814218.